Beautifully engraved certificate from the Scient Corporation issued in 2001. This historic document was printed by the Security-Columbian United States Banknote Company and has an ornate border around it with a vignette of the company's logo. This item has the printed signatures of the Company’s President, robert Howe and Chief Executive Officer, and Chief Financial Officer, Executive Vice President, Treasurer and Secretary, William Kurtz and is over 16 years old. 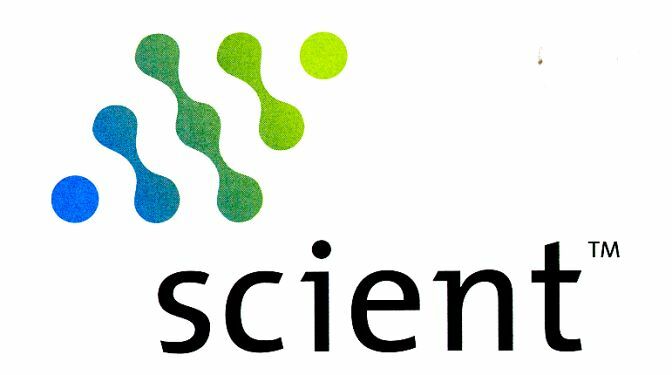 Scient was a San Francisco-based Internet consulting company, founded in 1997, that was one of the large American consulting firms during the dot-com bubble. The company was founded by Eric Greenberg, who had previously founded its competitor, Viant. Its CEO was Robert Howe, the former head of IBM global consulting. At its height in the fall of 2000, it had quarterly revenues of US$100 million, 1,180 employees and a stock price of US$133. In August 2001, it bought rival company iXL; by then its quarterly revenues were down to US$11 million. 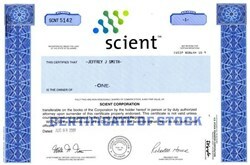 In July 2002, the company filed for bankruptcy and was bought by SBI and Company, SBI Group later sold Scient with the other members of Avenue_A/Razorfish to a company called aQuantive. aQuantive, in turn, was bought by Microsoft in August 2007 and became Microsoft's newly-created Advertiser and Publisher Solutions (APS) Group.